For Sunday football watching this week, we decided on meatballs as one of the snacks. I had thought that the meatballs would be the feature of this column, as I added pepperoni to the mixture. Unfortunately the pepperoni was lost, and they tasted pretty much like basic beef-based meatballs. Thankfully I decided to try making some herb-infused bread filled and covered with cheese. This cheesy bread was the highlight of our menu. The meatballs were fine. The roasted zucchini that was part of the menu was tasty also. However, the bread stole the show. Between the gooey-ness of the cheese, the savory taste of the basil and garlic, and the tenderness of the bread, it was impossible to resist. I think if I had been slower in making my plate my husband could have eaten all of it on his own. The bread portion of the recipe makes enough for two batches. If you have more than two people eating, you should bake both. (You will need to double the filling/topping ingredients.) If it is a gathering of two, save the second portion of dough for baking in the next day or two. Dissolve yeast and sugar in water in mixing bowl. Add 2 cups flour, salt, olive oil, garlic powder, and basil. Attach dough hook and mix for approximately one minute on speed two. Add more flour, as needed, until dough clings to hook and cleans sides of the bowl. Knead for an additional 2 minutes. Place dough in a greased bowl, turning so that top is greased. Cover with plastic wrap, and place in a warm place to rise, approximately 1 hour. After an hour, preheat oven to 450. Place an inverted baking sheet in oven on middle rack. Combine 1/2 cup mozzarella, cheddar, parmesan, and garlic salt in a small bowl. Coat a large cutting board with flour. Take half of the dough and transfer to prepared board. Roll into a 12″x8″ rectangle. Sprinkle remaining half cup of mozzarella on one half of the dough (preferably so that you have 12″x4″ covered with cheese). 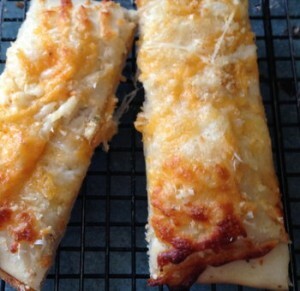 Fold uncovered half over cheese. When oven is heated transfer bread from cutting board to inverted baking sheet. Sprinkle cheese mixture on top of bread. Bake for 14 minutes. When dough is golden remove from oven and place on cooling rack. Allow to sit for a minute or two, then slice and serve.